Their best receiver, who incidentally happens to be the best on the planet, is still sideline by injury and has registered a pedestrian 22 catches at the season’s midway point. 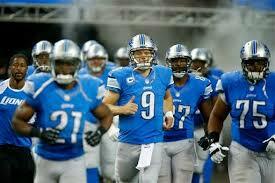 The Detroit Lions are 6-2 so far this season and are in first place in the NFC North. At one point last week they were so thin at defensive tackle that they had to give extensive play to rookie fifth-round draft choice Caraun Reid, he of Princeton. The running game is still putrid and the quarterback still makes too many mistakes, but at 6-2 one can’t help but get excited by the Detroit Lions, surprising sole owners of first place in the NFC North. Oh, we’ve seen this act before in Detroit. One need look back only a year to the Lions having a golden opportunity to steal an injury-ravaged division, a chance they squandered with authority down the stretch to the Packers and Bears. But this isn’t the Jim Schwartz Era anymore. After a season of almost dead average defense, the Lions (and not the Seahawks or Niners or any of those more highly touted teams out west) have allowed the fewest points in the league (under 16 per game) under Jim Caldwell and that alone is enough to take notice. Detroit has also find a nice more-than-complementary piece in Golden Tate, who could be on his way to the Pro Bowl with 55 catches for 800 yards, a total rapidly approaching what he achieved in a full season last year in Seattle. Team him with a healthy Calvin Johnson and the Lions have to wonder if they have the best wideout tandem in the league. But getting back to that defense: it brings the heat (23 sacks), shuts down the run (four rushing touchdowns allowed all season), but still occasionally bends as illustrated by a 21-0 halftime deficit against the underachieving Falcons last week in London. The difference between this year and last? To this point the Lions are resilient, grinding out the close ones, going 3-1 in games decided by a touchdown or less, including wins by a combined total of three points against New Orleans and Atlanta the last two weeks. This last one had all the makings of a 2013 redux when Detroit’s primary Achilles heal popped up in the final moments as Matt Prater missed a 43-yard attempt. But maybe the football gods have decided that this is Detroit’s year; a delay-of-game penalty gave Prater a second chance from 48, which he cashed in to give the Lions the surreal win. Note that there hasn’t been very much of this out of the Motor City in our collective memory; the Lions have made the playoffs only once since 1999 and haven’t won a playoff game since 1991. Their last playoff win before that was 1983 and they haven’t won an NFL title since 1957, enough to make the Kansas City Royals look like a dynasty. Under Stafford, the top pick overall in 2009, the news has been more bad than good (he owns a career 30-39 record) with plenty of false hope and underachievement. Looking ahead at a schedule that includes road games at Arizona, New England and Green Bay, it is still easy to imagine the Lions surrendering the division lead and maybe not making the playoffs at all. But the Lions’ depth may not allow that to happen; seven defenders already have multiple sacks and Stafford his playing his best since 2011, when the Lions won 10 games and last made the playoffs. That mark was achieved in spite of the defense allowing 30 points or more six times, a mark no one has achieved this year against Detroit. But then Motor City fans are used to holding their breath. When you haven’t won in 57 years, that is the rule and not the exception.